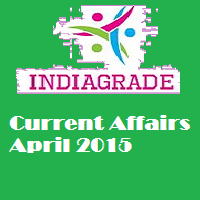 Current Affairs 2nd April 2015: Our www.indiagrade.com will daily update the important current affairs for government exam preparation. Every day so many number of candidates following this website. Our team will update all latest recruitment in Govt, bank, railways, private sectors. These days getting jobs in good company or organization is very tough, because large amount of students completing engineering, arts and etc courses. If you want to success means you must have unique talent. Think different and do your work regularly then chance will come to you. Please download the current affairs of 02/04/2015 in PDF format from below. Islamic gunmen storm Kenyan college, 15 killed; Christians people targeted. Pakistan 8th most dangerous country in the world: Report. Iraq and Syria are in top 2 position. Odisha Government launched Aahar Scheme to provide subsidised food to urban poor. Andhra Pradesh govt approves Amaravathi as new state capital. Indirect tax collection exceeds revised estimate by Rs 4000 cr. Punjab Government launches Padho Punjab Khedo Punjab Mission. PM Narendra Modi reaches Bengaluru for BJP national executive meet. Malaysia Open: Saina Nehwal enters quarterfinals defeating Chinese Yao Xue in second round. McCullum named New Zealand Cricketer of the Year. Mahavir Jayanti, also known as Mahavir Janma Kalyanak, is the most important religious holiday for Jains. It celebrates the birth of Mahavira, twenty fourth and the last Tirthankara of present time cycle. On the Gregorian calendar, the holiday occurs either in March month or April month. President, PM greet people on Mahavir Jayanti wishes.